Why Choose Vecoplan? - Versatility! Document destruction helps protect against identity theft and other use of classified or secure documents. These include bank statements, receipts, credit card information and other sensitive data. Smaller shred size means a higher level of security, minimizing the chance that someone could put two or more pieces of information together. Whether documents come in paper form, CDs, video tapes, or within electronic memory devices, Vecoplan has the versatility to provide a secure process that suits your needs and level of confidentiality. Vecoplan systems include a secure surge hopper for batch and conveyor feed for large dimension feedstock. 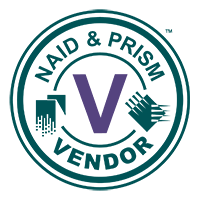 A high throughput coupled with high volume security delivers high efficiency and lower costs. Along with jam free operation, you can count on a rapid rate of document and record continuous flow throughput. Providing shredding services for over 40 years, Vecoplan is a pioneer in the most reliable and effective shredders in the industry today. 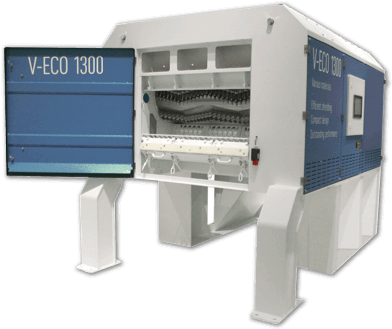 Traditional strip shredders simply can't shred anything but paper and, as the name implies, they cut documents into consistent strips producing a shred that is far from secure. To remedy this security issue, the shredded material must be turned 90 degrees and shredded again. This process is referred to as “Cross Shredding”. 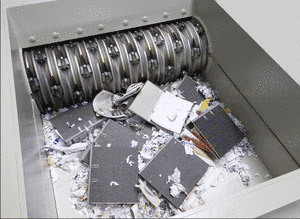 Although cross shredding is more secure than strip shredding, security concerns still exist. Vecoplan's secure Dump-And-Run shredders offer a solution that handles a wide variety of materials and is more secure than cross shredding. 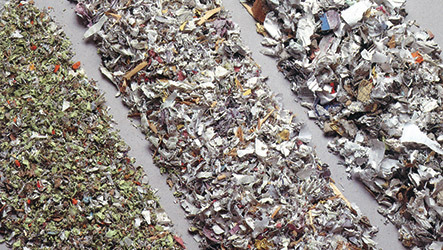 Because the discharge is screened, there is no possibility of documents escaping the shredding process. This method delivers shred sizes more secure that cross shreds, and in a one step process. And you determine the security level by the size of screen you put on your Vecoplan shredder.